The Aleut Culture Area includes the Aleutian Islands and the nearby Alaska Peninsula at the Southern edge of Alaska. The term “Aleut” was introduced by Russians and comes originally from the Koryak or Chukchi languages of Siberia. Aleut comes from the Russian word Aleuty. The Athabascan Culture Area, also known as the “Interior” of Alaska, runs from south of the Brooks Mountain Range down to the Kenai Peninsula. The Athabascans of Alaska traditionally lived along five Alaskan rivers: the Yukon, the Tanana, the Susitna, the Kuskokwim, and the Copper River. 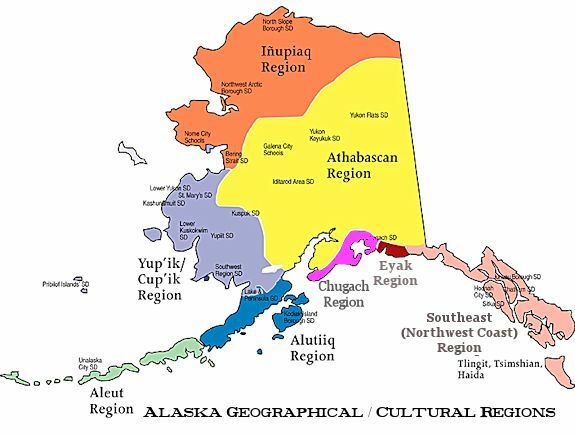 The Eyak Culture Area is the smallest native group in Alaska. Their traditional village on the Copper River highway on the Malaspina Coastal Plain was absorbed into the town of Cordova, Alaska in 1906, when their numbers had dwindled to only about 60 Eyak remaining.